St Joachim and St Anne were the Blessed Virgin Mary’s parents. Neither are mentioned in the Bible. According to early Church tradition, St Joachim was a deeply religious man and both were descendants of the house of David. Initially, they lived in Galilee but then moved to Jerusalem. After St Joachim fasted and prayed for forty days in the desert, Angels appeared to them promising a child. The child was the Blessed Virgin Mary. 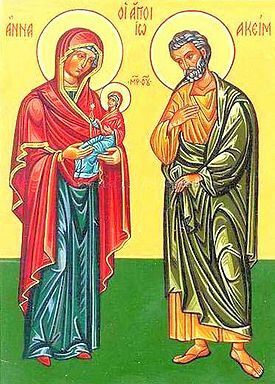 St Joachim and St Anne’s Feast Day is the 26th July. St Joachim is the Patron Saint of Fathers and Grandparents. St Anne is the Patron Saint of Brittany, Canada and Detroit as well as carpenters, childless people, equestrians, grandparents, housewives, lace makers and lost articles. Pray that we will thank the Lord for his goodness; His daily blessings; His love and mercy.